Seems like a great idea, right? Fit everything together for your sprinkler system (or laundry-hamper-holder) so you know exactly how long the pipe needs to be cut, then take it apart and glue back together permanently. If you dry fit PVC plumbing connections, you’ll wind up with PVC fittings that only allow the pipe to go in part of the way, rather than all the way like they will when you’ve got them all gooey with glue. Why not, you ask? It works with Legoes, wooden dowels, puzzles, the tile you set last weekend, and all sorts of other stuff you’ve done before. What’s so special about PVC plumbing fittings that they won’t let you test out your design precisely? What happened to measure twice, cut once? Are you doomed to have to hire a pro or screw up over and over? Not necessarily, but let’s explain a bit about PVC plumbing fittings and then go from there. PVC fittings are designed to connect to PVC pipe by interference fit, also known as a press fit or friction fit. What this means is that the fitting is designed so that it does not exactly match the pipe – the hub of the PVC plumbing fitting is actually tapered a bit to make an extremely snug fit so there’s no gaps for PVC glue/cement to fill in. This is a good thing when you think about it (hmm… incomplete seal = leaks = bad). Why is this important? Despite the name, PVC glue is not glue at all. It’s actually a solvent that kind of liquefies the PVC it touches so the pipe and the fitting will essentially melt together where they are “glued”. Think of it like welding metal – same idea but with chemicals instead of a torch (and less chance of catching things on fire). Once cemented together and the connection has cured, the pipe and fitting are no longer separate pieces, which is what makes a properly cemented PVC connection virtually leak-proof. Also, since you’ve got cement gooped on, the fitting slips in much easier. Learn more about PVC and PVC cement here. Okay, so we know why dry fitting PVC plumbing fittings won’t work the way you want, but what to do about it? Surprisingly, the answer is incredibly simple: use a ruler or measuring tape. No, seriously – check out the inside of a PVC fitting (or click on the picture to your left); you can see where the end of the pipe will be once properly cemented and inserted. Simply measure from that point and you’ll quickly find out how much pipe you’ll need to get to the next fitting. Some people have a good eye for how the pipe will fit by just looking at the outside of the fitting and can simply line up the pipe and fitting right next to each other and go from there. Please note, different PVC fitting manufacturers might have slightly different hub lengths, so if you’re sourcing your fittings from multiple vendors and need a high degree of precision, you might want to measure each fitting. If you’re sourcing all fittings from the same manufacturer, you shouldn’t need to check every fitting, but we would recommend checking at least one from each different type of fitting (90 degree elbow, tee, side outlet 90, coupling, etc) and size. It’ll only take a minute and will really help make the project go much more smoothly. Now that you know how to “dry fit” your PVC plumbing fittings, get out there and finish those projects! Your turn: what’s the most useful thing you’ve learned about working with PVC? This entry was posted in DIY, Do it yourself, home improvement, Home Repairs, Plumbing, PVC, Water and tagged DIY, hints and tips, plumbing, pvc on June 22, 2012 by PlumbingSupply.com. Since opening our virtual doors in 1995, we have been known as the leading Internet plumbing supplier. We started out with a mission to transform the task of buying plumbing related products into an enjoyable experience and offer the largest selection of plumbing supplies anywhere. Today, we continue with that mission by providing top quality plumbing products at the lowest possible prices, with strong focus on providing you with excellent customer service. We here at PlumbingSupply.com sincerely believe that our customers should always come first. Good advice for people new to working with PVC. I would have thought it was a bit obvious though. Of couse, the only PVC work I’ve done was outdoor watering stuff where a few 16ths one way or the other didn’t really matter. Thanks for checking us out! What would you have liked to know when first working with PVC? I didn’t even know PVC glue existed. Always dry fit apparently, but never was using it to pump water in. Only to build structures (raised bed floating row covers). So to confirm, you -don’t- need the glue to make it water sealed? Glue or cement -is- needed to make PVC systems water sealed. Our apologies if the post wasn’t clear on this! Dry fitting is more a way to get an idea of how everything is going together rather than a permanent setup. For your raised bed floating row covers, connecting everything dry and letting it stay that way is no big deal, but if you’re actually plumbing something, glue/cement is required to essentially weld the joint and create a permanent bond between fitting and pipe. This is especially important if underground or indoors as bugs, plants, and animals will use any crack to get to water. Also, any blockages in the system will cause leaks at unsealed joints. So, again, if you need it water sealed, glue it! 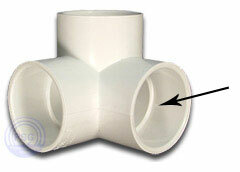 PVC fittings are designed to connect to PVC pipe by an interference fit. This is a typical fitting service use while connecting plumbing pipes often. It yielded best and permanent solution of the plumbing issues occurred in the house at the time of maintenance. Now I am aware that there is a PVC glue existed. Is it really exclusive for a PVC? Anyway, thanks for this interesting post. Thanks! For best results, you should always use the correct kind of cements/glue that’s appropriate to the material you’re working with, especially if your project is subject to inspection. PVC glue on something else won’t meld the components together properly, if at all, and virtually guarantees a failure down the line. Just don’t do it! I think we have to hire the plumber firstly because a small mistake of us can ruined our money. Nice Post for people new to working with PVC. Thanks for sharing a brief article. thePlumber.com has a new look! PlumbingSupply.com has a new design!